With its colorful foliage, Heuchera is the perfect perennial to brighten up any garden throughout the entire growing season. Heuchera forms attractive basal mounds with heart-shaped, rounded, or triangular leaves which can be smooth wavy, or ruffled. The leaf coloration varies by cultivar, but mainly includes various hues of amber, bronze-green, green, gold, pink, purple, deep purple and silver veined. In many instances, the coloration of the leaves varies with their environment and often changes with the seasons. In most locations, they are considered evergreen as the foliage lasts throughout the year. They produce clusters of cream to red colored coral bell shaped flowers on tall wiry stems that rise above the basal foliage in the late spring. Depending on the cultivar, they bloom from a few weeks or throughout the entire season. There are 50 to 70 species of Heuchera which are native to North America. Many of the improved varieties available today are hybrids showcasing various foliage colorations and flowering characteristics. The genus Heuchera was named after an 18th century German professor of medicine and botanist Johann Heinrich von Heucher (1677-1747) who specialized in medicinal plants. The common name 'coral bells' is derived from the nodding, bell-shaped flowers. Coral bells are generally hardy throughout Zones 4 to 9. However, several cultivars are hardy to Zone 3 and a few of them can tolerate the heat and humidity of Zone 11. The foliage of most cultivars reaches 8 to 12 inches in height with a spread of 1 to 2 feet wide. When blooming, the flower stalks reach 1 to 3 feet tall. 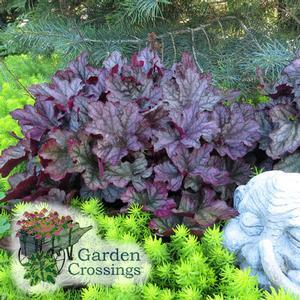 Coral bells prefer to be planted in locations with a fertile, moist, well-drained soil. They particularly do not perform well in locations with poor drainage during the winter months. Most Heuchera cultivars will grow more vigorously and have the best leaf coloration when they are planted in locations with partial shade, particularly in the afternoon. Purple leafed cultivars can tolerate more direct sun; in general the darker the purple coloration the more exposure to sun they can tolerate. Conversely, the amber and gold leafed cultivars are less sun tolerant; the more yellow the leaf coloration, the less tolerant to sun they are. In locations with full sun or full shade, most cultivars will usually survive, but they will be smaller and not look as lively. Generally considered easy to grow and require little routine maintenance. To encourage continuous flowering or repeat bloom, deadhead the spent flower spikes as needed. Mulching during the summer months will help keep the soil moist and prevent injury to the shallow root system from heat. They can be divided every 3 to 4 years if they lose vigor or when the crown gets too large. Generally, they can be grown without any insect or disease problems. Bacterial and fungal leaf spots, Botrytis, Japanese beetles, powdery mildew, and strawberry root weevils may occasionally, but not usually, become problematic. Some cultivars may get leaf scorch when they are planted in hot, full sun. Overly wet conditions during the winter months can lead to some plants rotting out. Where climates fluctuate, frost heaving (where the plants push themselves up out of the ground) can be a concern; mulching before winter may help prevent this problem. Heuchera are commonly used as accent or specimen plants, in woodland gardens or rock gardens, and as groundcovers or mass plantings. They are commonly used in patio pots or as components in mixed containers. The flower panicles make fine additions to cut flower arrangements. Heuchera attracts butterflies and hummingbirds into the garden. They are also deer resistant. Coral bells blend well with other shade loving perennials including Astilbe, Dicentra, ferns, Hakonechloa, Helleborus, and Hostas. In sunny locations, they work well with numerous perennials such as Alchemilla, Artemisia, Carex, Corydalis, Geranium, Lamium, Lysimachia, and ornamental grasses.